We should probably do a more in-depth look at probability in RPGs or video games in general. But for now, this is what we’re doing with probability in Himeko Sutori. The way level-ups work in Himeko Sutori is you get XP (or experience points, but if you’re reading a gamedev blog you knew that already) from battles, with XP you level up, and then when you level up, you get to draw level-up cards. Every character class has a deck of cards, and at every level-up, you get to draw three cards for that character. Sometimes those cards unlock a new character class. You start with two character classes and eventually you can unlock up to 20. But initial test play revealed that players were spending too much time at the lower-tiered character classes and weren’t able to switch classes as often as we had hoped. 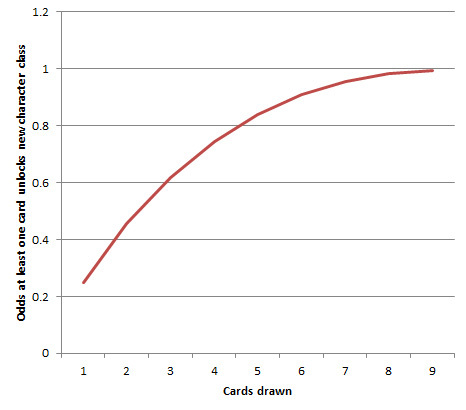 So we took a look at the probabilities of drawing a class-unlock card, and basically stacked the deck to ensure unlocks more often. But we didn’t just go about that all willy-nilly. We figured we wanted to have a fair likelihood of unlocking a new class even after just one level-up, and we didn’t want anyone to have to grind more than three levels in a class just to unlock a different class. So with the first two available character classes, there are 12 level-up cards, and three of them unlock a new character class. If you draw three cards at each level-up, you have a 62% chance of unlocking at least one character class at your first level-up, and a 91% chance of unlocking at least one character class by your second level-up. That’s going to make changing character classes a lot easier.